Nassau County Crime Stoppers are looking for the man responsible for sexually attacking a masseuse at a Long Island spa on Monday. A photo of the suspect has been released. Read the full story here! Around 7 p.m. on Monday, a man walking into a Hicksville spa requesting for massage services ended up being a sexual attacker. A masseuse was sexually abused before the man fled the scene. Now, Nassau County police are requesting anyone with information to contact Nassau County Crime Stoppers. 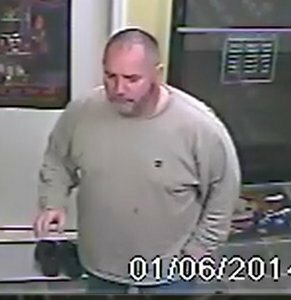 According to detectives, the suspect is described as a male white subject around 40 to 50 years of age, approximately 5-feet, 9-inches tall, 200 to 215 pounds, with a shaved head and beard, and wearing a long sleeve tan colored tee shirt and blue jeans. The suspect entered Red Bell Spa at 107 Newbridge Road in Hicksville. The attacker asked for a massage, which he was then directed to go to a room to undress, lie on a table, and cover his body with a blanket, but when the victim entered the room, the man had his entire body exposed. The victim proceeded to direct him to the table where he lied down and covered him with a sheet. After the massage began, the man grabbed the victim’s right arm attempting to have her touch him in a sexual manner. After the victim backed away, the man became agitated and approached her, backing her into a corner where a struggle ensued and he touched her in an inappropriate sexual manner, according to detectives. The victim was able to escape the room and called police while the man fled the scene. Anyone with information regarding this crime is asked to contact Nassau County Crime Stoppers at (800) 244-TIPS. All callers will remain confidential. Photo released by Hicksville spa, obtained from Nassau County Police. Subject: LongIsland.com - Your Name sent you Article details of "Man Asking for Massage Services at Long Island Spa Sexually Abuses Masseuse, Police Seek Suspect"